Nov. 28, 2017, 7:30pm: Played Baroque flute with early music ensemble Rejouissance and the Dalhousie Chorus directed by Gary Ewer at St. Andrews United Church, Halifax. Nov. 19, 2017: The Maritime Conservatory of Performing Arts Traditional Music Ensemble, under the direction of Jennifer Publicover, and Vivid Vocal Ensemble, under the direction of Zoe Leger, collaborated to produce a music video covering Joni Mitchell's classic "Both Sides Now" for the CBC Music Class Challenge. Here is the video. Nov. 18, all day: Faculty coach on Baroque flute for the Early Music Society of Nova Scotia Early Music Camp at St. Mark's Church, corner Gottingen and Russell Streets, Halifax NS. Performing Bach and Marais on faculty recital. Nov. 4, 2017, 2:00pm: Papilio in Concert at the Lunenburg School of the Arts, 6 Prince St., Lunenburg NS. Oct. 14, 2017, 6:00pm-11:00pm: Played with harpist Alys Howe as the Wildwood Flute and Harp Duo as part of Nocturne Halifax at the Hidden Gallery, 1469 Birmingham St. Halifax NS. Oct. 7, 2017, 6:00pm-11:00pm: Papilio played at Lunenburg Oktoberfest on behalf of the Boxwood Festival. Sept. 30, 2017, 7:00pm: Papilio in full concert at Knox United Church, Lower Sackville NS. Sept. 27, 2017, 5:00 - 6:30 ADT: Presented material from my MES thesis and participating in panel discussion at VOICES online conference for the teaching of STEM subjects through music. Sept. 16, 2017, 8:30pm: Papilio played at the Halifax Celtic Festival. June 30, 2017, 7:30pm: Boxwood Harp Celebration Concert, Lunenburg Academy of Musical Performance, Lunenburg NS. Guest on Irish and modern flutes with celtic harpers featured: Ellen Gibling, Alys Howe, Cheryl Reid O'Hagan, and Lydia Maksym. May 29 - June 11, 2017: Studied Baroque flute under Jed Wentz at the Tafelmusik Baroque Summer Institute in Toronto, Ontario. Grateful recipient of a professional development fellowship from the Maritime Conservatory of Performing Arts to be applied towards this professional early music training program. May 20, 2017, 2:45pm: Gave 45 min. workshop entitled "Music as a Tool for Environmental Education and Advocacy" at See Change, the annual conference of the Canadian Network for Environmental Education (EECOM) at Acadia University, Wolfville NS. Premiered this composition May 18, 2017 with Gillian Smith (violin) and Jacob Caines (bass clarinet). 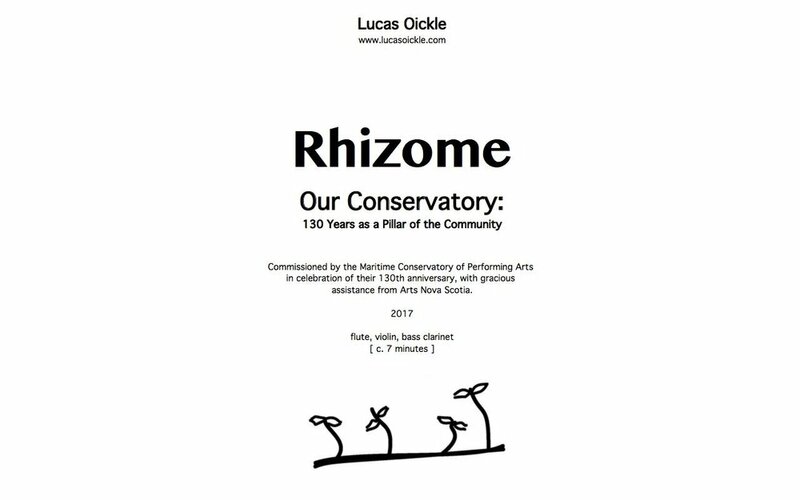 May 18, 2017, 6:30pm: Performed in premier of "Rhizome", an original composition for flute, violin, and bass clarinet by Lucas Oickle commissioned for the 130th anniversary of the historic Maritime Conservatory of Performing Arts. With Gillian Smith and Jacob Caines. April 26 - 28, 2017 : Flute clinician for Atlantic Festival of Bands, Mount Saint Vincent University, Halifax; and, Papilio was the house band for the AFB Ceili and Kitchen Party at Murphy's on the Water, Halifax. March 18, 2017, 8pm: Papilio was the house band for Halifax Contra Dances at All Nations' Church, 2535 Robie St., Halifax NS. March 4, 2017, all day with 7pm concert: Coached and performed as faculty for Woodwinds and Brass Chamber Day at the Maritime Conservatory of Performing Arts, 6199 Chebucto Rd., Halifax NS.